"The guy is a ghost collecting ghosts." 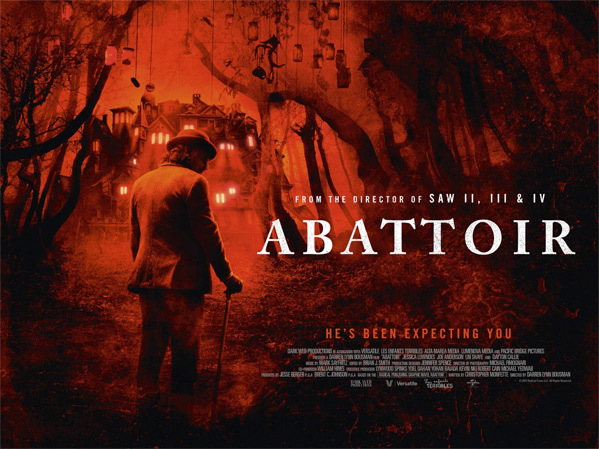 Momentum Pictures has debuted a new trailer for the haunted house horror thriller Abattoir, from director Darren Bousman (of Saw II-IV and Repo! The Genetic Opera). The film stars Jessica Lowndes as a real estate reporter who teams up with a cop to investigate the death of her family. This leads her to discover a house in the town of New English called the Abattoir, featuring "stitched together" unending rooms of death. There's obviously something much more sinister going on with this place, but the question that keeps coming up is: "How do you build a haunted house?" The cast includes Joe Anderson, Dayton Callie, John McConnell and Lin Shaye. If you're a horror fan, give this a look. A real estate reporter investigates Jebediah Crone (Dayton Callie), a mysterious old man who is building a haunted house constructed from rooms where deaths have occurred. Set in a time no one knows… Abattoir is directed by American horror filmmaker Darren Lynn Bousman, of the films Saw II, Saw III, Saw IV, Repo! The Genetic Opera, Mother's Day, 11-11-11, The Barrens, and The Devil's Carnival previously. The screenplay is written by Christopher Monfette, based on the comic book miniseries. The film originally premiered at the Los Angeles Film Festival and Fantasia Film Festival earlier this year. Momentum Pictures will open Bousman's Abattoir in select theaters starting December 9th this fall. Anyone interested in this? That's a pretty cool premise. That guy killed it on SONS OF ANARCHY and DEADWOOD...but this looks like he reigned it way in. Dig the idea, plus Dayton Callie is a bad mofo. I'm definitely interested.